From the top: Central Bogota, La Candelaria, Torre Colpatria, Capitolio Nacional and the Gold Museum. ("The South American Athens") "Muy Noble y Muy Leal Ciudad "
Bogotá (/ˈboʊɡətɑː/, /ˌbɒɡəˈtɑː/, /ˌboʊ-/; Spanish pronunciation: [boɣoˈta] ( listen)), officially Bogotá, Distrito Capital, abbreviated Bogotá, D.C., and formerly known as Santafé/Santa Fé de Bogotá between 1991 and 2000, is the capital and largest city of Colombia, administered as the Capital District, although often erroneously thought of as part of Cundinamarca. Bogotá is a territorial entity of the first order, with the same administrative status as the departments of Colombia. It is the political, economic, administrative and industrial center of the country. The city is located in the center of Colombia, on a high plateau known as the Bogotá savanna, part of the Altiplano Cundiboyacense located in the Eastern Cordillera of the Andes. It is the third-highest capital in South America and in the world after Quito and La Paz, at an average of 2,640 metres (8,660 ft) above sea level. Subdivided into 20 localities, Bogotá has an area of 1,587 square kilometres (613 square miles) and a relatively cool climate that is constant through the year. 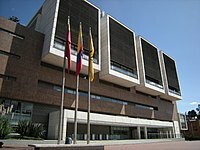 The city is home to central offices of the executive branch (Office of the President), the legislative branch (Congress of Colombia) and the judicial branch (Supreme Court of Justice, Constitutional Court, Council of State and the Superior Council of Judicature) of the Colombian government. Bogotá stands out for its economic strength and associated financial maturity, its attractiveness to global companies and the quality of human capital. It is the financial and commercial heart of Colombia, with the most business activity of any city in the country. The capital hosts the main financial market in Colombia and the Andean natural region, and is the leading destination for new foreign direct investment projects coming into Latin America and Colombia. It has the highest nominal GDP in the country, responsible for almost a quarter of the nation's total (24.7%). The city's airport, El Dorado International Airport, named after the mythical El Dorado, handles the largest cargo volume in Latin America, and is third in number of people. Bogotá is home to the largest number of universities and research centers in the country, and is an important cultural center, with many theaters, libraries and museums, of which the Museo del Oro is the most important. Bogotá ranks 52nd on the Global Cities Index 2014, and is considered a global city type "Alpha −" by GaWC. The area of modern Bogotá was first populated by groups of indigenous people who migrated south based on the relation with the other Chibcha languages; the Bogotá savanna was the southernmost Chibcha-speaking group that exists from Nicaragua to the Andes in Colombia. The civilisation built by the Muisca, who settled in the valleys and fertile highlands of and surrounding the Altiplano Cundiboyacense (modern-day departments of Cundinamarca and Boyacá and small parts of Santander), was one of the four great civilisations in the Americas. The name Muisca Confederation has been given to a loose egalitarian society of various chiefs (caciques) who lived in small settlements of maximum 100 bohíos. The agriculture and salt-based society of the people was rich in goldworking, trade and mummification. The religion of the Muisca consisted of various gods, mostly related to natural phenomena as the Sun (Sué) and his wife, the Moon; Chía, rain Chibchacum, rainbow Cuchavira and with building and feasting (Nencatacoa) and wisdom (Bochica). Their complex luni-solar calendar, deciphered by Manuel Izquierdo based on work by Duquesne, followed three different sets of years, where the sidereal and synodic months were represented. Their astronomical knowledge is represented in one of the few extant landmarks of the architecture of the Muisca in El Infiernito outside Villa de Leyva to the north of Bogotá. The first populations inhabiting the present-day Metropolitan Area of Bogotá, were hunter-gatherer people in the late Pleistocene. The oldest dated evidence thus far has been discovered in El Abra (12,500 BP), north of Zipaquirá. Slightly later dated excavations in a rock shelter southwest of the city in Soacha provided ages of ~11,000 BP; Tequendama. Since around 0 AD, the Muisca domesticated guinea pigs, part of their meat diet. The people inhabiting the Bogotá savanna in the late 15th century were the Muisca, speaking Muysccubun, a member of the Chibcha language family. Muisca means "people" or "person", making "Muisca people", how they are called, a tautology. At the arrival of the conquerors, the population was estimated to be half a million indigenous people on the Bogotá savanna of up to two million in the Muisca Confederation. They occupied the highland and mild climate flanks between the Sumapaz Mountains to the southwest and Cocuy's snowy peak to the northeast, covering an approximate area of 25,000 km2 (9,653 sq mi), comprising Bogotá's high plain, the current Boyacá department portion and a small Santander region. Trade was the most important activity of the Muisca with other Chibcha-speaking neighbours, such as the Guane, Lache and U'wa and with Cariban groups as the Muzo or "Emerald People". Their knowledge of salt production from brines, a task exclusively for the Muisca women, gave them the name "Salt People". Tropical fruits that didn't grow on the cool highlands, coca, cotton and gold were traded at markets that took place every Muisca week; every four days. At these frequent markets, the Muisca obtained various luxury goods that seem worthless in modern sense and precious metals and gemstones that seem valuable to us became abundant and used for various purposes. The Muisca warrior elite was allowed to wear feathered crowns, from parrots and macacs whose habitat was to the east of the Andes; the Arawkan-speaking Guayupe, Tegua and Achagua. The Muisca cuisine consisted of a stable and varied diet of tubers, potatoes and fruits. Maize was the main ingredient of the Muisca, cultivated on elevated and irrigated terraces. In Muysccubun exist many words for maize, corn and the various types and forms of it. The product was also the base for chicha; the alcoholic beverage of the people, still sold in central Bogotá today. It was the drink for construction of houses, celebrations of harvests and sowing, ritual practices around the various sacred sites of the Altiplano, music and dances, trade at special ferias with farther away trading indigenous groups of Colombia and to inaugurate the new highest regarded member of the community; zipas, zaques, caciques and the religious ruler iraca from Sacred City of the Sun Sugamuxi. The zipa at the moment of Spanish conquest was Tisquesusa. His main bohío was in Bacatá with others in Funza and Cajicá, giving name to the present day capital of Colombia. A prophecy in his life came true; he would be dying, bathing in his own blood. Defending Funza with a reduced army of guecha warriors against the heavily exhausted but heavily armed strangers, his reign fell in the hands of Gonzalo Jiménez de Quesada and his younger brother Hernán Pérez on April 20, 1537. Upon his death, his brother Sagipa became the last zipa, against the inheritance tradition of the Muisca. Sagipa used to be a main captain for Tisquesusa but quickly submitted to the Spanish rulers. The first encomenderos asked high prices in valuable products and agricultural production from the indigenous people. On top of that epidemics of European viruses razed through the population, of which in current Boyacá 65–85 % of the Muisca were killed within 100 years. Bogotá was founded by Gonzalo Jiménez de Quesada traditionally on the 6th of August 1538. Other documents state a second establishment was done on April 27, 1539. Gonzalo Jiménez and main conquerors De Belalcázar and Federmann, left for Spain in April 1539, founding Guataquí together on April 6, 1539. The rule over the fresh New Kingdom of Granada was left to Hernán. The first mayors of the city were capitains Pedro de Arevalo y Jeronimo de Inzar. Bogotá became the capital of the later Viceroyalty of New Granada. With independence, Bogotá became capital of Gran Colombia and later the capital of the Republic of Colombia. 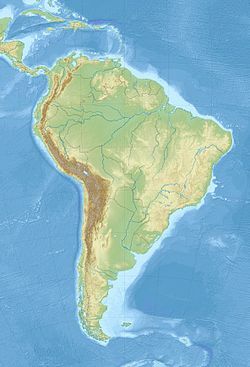 From 1533, a belief persisted that the Río Grande de la Magdalena was the trail to the South Sea, to Perú, legendary El Dorado. Such was the target of Gonzalo Jiménez de Quesada, the Granadanian conquistador who left Santa Marta on 6 April 1536 with 800 soldiers, heading towards the interior of current Colombia. The expedition divided into two groups, one under Quesada's command to move on land, and the other commanded by Diego de Urbino would go up river in four brigantine ships to, later on, meet Quesada troops at the site named Tora de las Barrancas Bermejas. When they arrived, they heard news about Indians inhabiting the south and making large salt cakes used to trade for wild cotton and fish. Jiménez decided to abandon the route to Peru and cross the mountain in search of salt villages. They saw crops, trails, white salt cakes and then huts where they found corn, yucca and beans. From Tora, the expedition went up the Opón River and found indigenous people covered with very finely painted cotton mantles. When they arrived in Muisca territories, of the expedition leaving Santa Marta, only 162 men were left. On the other side to Plaza de Bolívar, the Chapter and the Royal Audience were located. 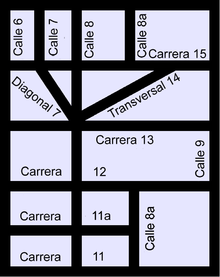 The street joining the Major Plaza and Herbs Plaza — Santander Park— was named Calle Real (Royal Street), now Carrera Séptima (or "Seventh Street"; counted from the mountains to the east of the city). Political unease felt all over Spanish colonies in America was expressed in New Granada in many different ways, accelerating the movement to independence. One of the most transcendent was the Revolution of Comuneros, a riot of the inhabitants started in Villa del Socorro —current Department of Santander—in March 1781. Spanish authorities suppressed the riot, and José Antonio Galán, the leader, was executed. He left an imprint, though. He was followed in 1794 by Antonio Nariño, precursor of independence by translating and publishing in Santa Fe, the Rights of Men and the Citizen, and by 20 July movement leaders in 1810. From a base of only 20,000 people in 1793, the city grew to approximately 117,000 people in 1912. Population growth was rapid after 1870, largely because of emigration from the eastern highlands. Bogotá is located in the southeastern part of the Bogotá savanna (Sabana de Bogotá) at an average altitude of 2,640 metres (8,660 ft) above sea level. The Bogotá savanna is popularly called "savannah" (sabana), but constitutes actually a high plateau in the Andes mountains, part of an extended region known as the Altiplano Cundiboyacense, which literally means "high plateau of Cundinamarca and Boyacá". In the extreme south of Bogota's District, the world's largest continuous paramo ecosystem can be found; Sumapaz Páramo in the locality Sumapaz. The Bogotá River running NE-SW crosses the sabana, forming Tequendama Falls (Salto del Tequendama) to the south. Tributary rivers form valleys with flourishing villages, whose economy is based on agriculture, livestock raising and artisanal production. The sabana is bordered to the east by the Eastern Cordillera of the Andes mountain range. The Eastern Hills, which limit city growth, run from south to north, and form east of the center the Guadalupe and Monserrate mountains. The western city limit is the Bogotá River. The Sumapaz Paramo (moorland) borders the south and to the north Bogotá extends over the plateau up to the towns of Chía and Sopó. Bogotá has a subtropical highland climate (Köppen Cfb). The average temperature is 14.5 °C (58 °F), varying from 6 to 19 °C (43 to 66 °F) on sunny days to 10 to 18 °C (50 to 64 °F) on rainy days. Dry and rainy seasons alternate throughout the year. The driest months are December, January, July and August. The warmest month is March, bringing a maximum of 19.7 °C (67.5 °F). The coolest nights occur in January, with an average of 7.6 °C (45.7 °F) in the city; fog is very usual in early morning, 220 days per year, whilst clear sky sunny full days are quite unusual. The rainiest months are April, May, September, October, and November, in which typical days are mostly overcast, with low clouds and some winds, bringing maximum temperatures of 18 °C (64 °F) and lows of 7 °C (45 °F). Bogotá has 20 localities, or districts, forming an extensive network of neighborhoods. Areas of higher economic status tend to be located in the north, close to the Eastern Hills in the districts of Chapinero, Usaquén and the east of Suba. The lower middle class inhabit the central, western and northwestern parts of the city.. The working-class neighborhoods are located in the south, some of them squatter areas. The ethnic composition of the city's population includes minorities of Afro-Colombian people (1.5%), and Indigenous Amerindians (0.2%); 98.27% of the population has no ethnic affiliation, but are mestizos and whites. Bogotá has gone to great lengths to change its formerly notorious crime rate and its image with increasing success after being considered in the 1990s to be one of the most violent cities in the world. In 1993 there were 4,352 murders at a rate of 81 per 100,000 people; in 2007 Bogotá suffered 1,401 murders at a rate of 20 per 100,000 inhabitants, and had a further reduction to 14 per 100,000 inhabitants in 2017 (the lowest since 1979). This success was mainly the result of a participatory and integrated security policy; "Comunidad Segura", that was first adopted in 1995 and continues to be enforced. 1.2 percent of street addresses account for 99 percent of homicides. The Mayor of Bogotá and the City Council – both elected by popular vote – are responsible for city administration. In 2015 Enrique Peñalosa was elected Mayor; his term runs from 2016 to 2019. The city is divided into 20 localities: Usaquén, Chapinero, Santa Fe, San Cristóbal, Usme, Tunjuelito, Bosa, Kennedy, Fontibón, Engativá, Suba, Barrios Unidos, Teusaquillo, Los Mártires, Antonio Nariño, Puente Aranda, La Candelaria, Rafael Uribe Uribe, Ciudad Bolívar and Sumapaz. In 2016 the World Cities Study Group and Network (GaWC) from the United Kingdom ranked Bogotá as an Alpha−World City in the World Cities Study Group's inventory, a high-ranking. Alpha and Alpha- cities are important world cities that link major economic regions into the world economy. Travel & Tourism's share of the city's overall GDP stands at 2.5%. Bogotá is responsible for 56% of the tourism that arrives to Colombia and is home 1,423 multinational companies. Bogotá also ranked highly as a global city where business is done and meetings are held. Bogotá is a growing international meetings destination. During the last year, Bogotá has won 50 major international events, with 12 more world-class events in progress. The 16th World Summit of Nobel Peace Laureates took place from February 2 to 5, 2017 in Bogotá, Colombia. One Young World is the preeminent global forum for young leaders aged 18–30. Bogotá, Colombia is the host city for Summit 2017. Important landmarks and tourist stops in Bogotá include the botanical garden José Celestino Mutis, the Quinta de Bolívar, the national observatory, the planetarium, Maloka, the Colpatria observation point, the observation point of La Calera, the monument of the American flags, and La Candelaria (the historical district of the city). 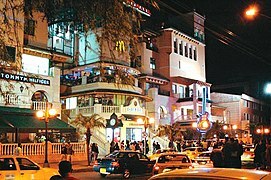 There is also Usaquen, a colonial landmark where brunch and flea market on Sundays is a traditional activity. The city has numerous green parks and amusement parks like Salitre Magico or Mundo Aventura. There are also several areas of the city where fine restaurants can be found. The G Zone, the T Zone, and La Macarena are well known for their gastronomic offerings. Since the 2000s, major hotel chains have established in the city. Bogota has a great cultural diversity, coming from different regions of the country, which allows the tourist to know the multiculturalism of the country without the need to travel to other cities, this includes gastronomy and different festivals. Bogota is home to several television stations like Canal Capital and Citytv which are local stations, Canal 13 is a regional station, and is home to the national channels Caracol TV, RCN TV, Canal Uno, Canal Institucional, and Señal Colombia. It has multiple satellite television services like Telefónica, Claro and DirecTV and several satellite dishes which offer hundreds of international channels, plus several exclusive channels for Bogotá. In Bogota, all the major radio networks in the country are available, in both AM and FM; 70% of the FM stations offer RDS service. There are several newspapers, including El Tiempo, El Espectador and El Nuevo Siglo, plus economical dailies La República and Portafolio, tabloids El Espacio, Q'Hubo, and Extra. Bogotá also offers three free newspapers, two Spanish, ADN and Publimetro, and one English, The Bogota Post. Energy and sewer bills are stratified based on the location of owner's residence, The system is the classification of the residential properties that should receive public services. Although the system does not consider the income per person and the rules say that the residential real estate should stratify and not households. All mayors should do the stratification of residential properties of their municipality or district. Bogotá's social strata have been divided as follows and have been extensively used by the government as a reference to develop social welfare programs, statistical information and to some degree for the assignment of lands. Bogotá's growth has placed a strain on its roads and highways, but since 1998 significant efforts to upgrade the infrastructure have been undertaken. Private car ownership forms a major part of the congestion, in addition to taxis, buses and commercial vehicles. Buses remain the main means of mass transit. There are two bus systems: the traditional system and the TransMilenio. The TransMilenio system was created during Enrique Peñalosa's mayoral term, and is a form of bus rapid transit that has been deployed as a measure to compensate for the lack of a subway or rail system. TransMilenio combines articulated buses that operate on dedicated bus roads (busways) and smaller buses (feeders) that operate in residential areas, bringing passengers to the main grid. TransMilenio's main routes are: Caracas Avenue, Northern Highway (Autopista Norte), 80th Street, Americas Avenue, Jiménez Avenue, and 30th Avenue (also referred to as Norte Quito Sur or N.Q.S. for short). Routes for Suba Avenue and Southern Highway (Autopista Sur), the southern leg of the 30th Avenue, were opened in April 2006. The third phase of the system will cover 7th Avenue, 10th Avenue, and 26th Street (or Avenida El Dorado). The system is planned to cover the entire city by 2030. 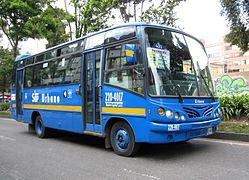 Although the Transmilenio carries commuters to numerous corners of the city, it is more expensive (US$0.80 or 2300 COP) than any public transport, except taxis. 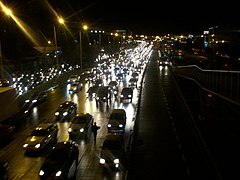 In addition to TransMilenio, the Peñalosa administration and voter-approved referenda helped to establish travel restrictions on cars with certain license plate numbers during peak hours called Pico y placa; 121 kilometres (75 miles) of Ciclovía on Sundays and major holidays; a massive system (376 km (234 mi) as of 2013[update]) of bicycle paths and segregated lanes called ciclorrutas; and the removal of thousands of parking spots in an attempt to make roads more pedestrian-friendly and discourage car use. Ciclorrutas is one of the most extensive dedicated bike path networks of any city in the world, with a total extension of 376 kilometres (234 miles). It extends from the north of the city, 170th Street, to the south, 27th Street, and from Monserrate on the east to the Bogotá River on the west. The ciclorruta was started by the 1995–1998 Antanas Mockus administration with a few kilometers, and considerably extended afterwards with the development of a Bicycle Master Plan and the addition of paths hundreds of kilometers in extent. Since the construction of the ciclorruta bicycle use in the city has increased, and a car free week was introduced in 2014. Bogotá's main airport is El Dorado International Airport, with an approximate area of 6.9 km² located west of the city's downtown in the Fontibón Locality. It is the third most important airport in Latin America after Mexico City International Airport and São Paulo–Guarulhos International Airport and it is the most important airport in Colombia. Construction of the airport was ordered by Gustavo Rojas Pinilla (19th President of Colombia) in 1955 to replace the Aeropuerto de Techo. Due to its central location in Colombia and in Latin America, it is a hub for Colombia's Flagship Carrier Avianca, Copa Airlines Colombia and LATAM Colombia. It is also serviced by a number of international airlines including American, Delta, United, Air France, KLM, Turkish Airlines, Jet Blue, and Lufthansa. The national airport has begun to take more responsibility due to the congestion at the international airport. In response to the high demand of approximately 27 Million passengers per year, a new airport, El Dorado II, is planned to be built by 2021, to help alleviate traffic at the main airport. Bogotá is the Colombian city with the most extensive and comprehensive network of bike paths. Bogotá's bike paths network or Ciclorutas de Bogotá in Spanish, designed and built during the administration of Mayors Antanas Mockus and Enrique Peñalosa, is also one of the most extensive in the world and the most extensive in Latin America. The network is integrated with the TransMilenio bus system which has bicycle parking facilities. Bogota implemented a healthy habit called "Ciclovia" where principal highways are closed from 7:00 a.m. until 2:00 pm on Sundays and public holidays; therefore, the People ride their bikes to enjoy the city as well as exercise. In the same way just on December the same activity is carried out in the night, there are some special activities such as fireworks, street theater performances, and street food just to mention a few. Since the 4th of April 2016 the carrera 11 has been reduced from four to three car lanes and a new bike lane (cicloruta) has been inaugurated. On 25 December 1884, the first tramway pulled by mules was inaugurated and covered the route from Plaza de Bolívar to Chapinero, and in 1892, the line connecting Plaza de Bolívar and La Sabana Station started operating. The tramway ran over wooden rails and was easily derailed, so steel rails imported from England were eventually installed. In 1894, a tramway car ran the Bogotá–Chapinero line every 20 minutes. The tram system eventually grew to cover most of the city and its surrounding suburbs. But during the Bogotazo riots of 1948, the system suffered heavy damage and was forced to close. The economic effects of the subsequent civil war that followed prevented the damage from being repaired. Parts of the system continued to operate in a reduced state until 1951, when they were replaced by buses. Most of the streetcar tracks were eventually paved over, but exposed tracks can still be seen on many of the older roads of the city, especially downtown and in the La Candelaria area, although it has been about 70 years[when?] since any vehicles have run on them. The average amount of time people spend commuting with public transit in Bogota, for example to and from work, on a weekday is 97 min. 32% of public transit riders, ride for more than 2 hours every day. The average amount of time people wait at a stop or station for public transit is 20 min, while 40% of riders wait for over 20 minutes on average every day. The average distance people usually ride in a single trip with public transit is 8 km, while 16% travel for over 12 km in a single direction. Known as the Athens of South America, Bogotá has an extensive educational system of both primary and secondary schools and colleges. Due to the constant migration of people into the nation's capital, the availability of quotas for access to education offered by the State free of charge is often insufficient. The city also has a diverse system of colleges and private schools. There are a number of universities, both public and private. In 2002, there were a total of 114 higher education institutions; in Bogotá there are several universities, most partially or fully accredited by the NAC (National Accreditation Council): National University of Colombia, University of the Andes, Colombia, District University of Bogotá, La Salle University, Colombia, University of La Sabana, Pontifical Xavierian University, Our Lady of the Rosary University, Universidad Externado de Colombia, Military University Nueva Granada, Central University, Colombia, University of America, Sergio Arboleda University, Jorge Tadeo Lozano University, Pilot University of Colombia, Catholic University of Colombia, Saint Thomas Aquinas University and Universidad Pedagógica Nacional. Bogotá has many cultural venues including 58 museums, 62 art galleries, 33 library networks, 45 stage theaters, 75 sports and attraction parks, and over 150 national monuments. Many of these are renowned globally such as: The Luis Ángel Arango Library, the most important in the region[according to whom?] which receives well over 6 million visitors a year; The Colombian National Museum, one of the oldest in the Americas, dating back to 1823; The Ibero-American Theater Festival, largest of its kind in the world, receives 2 million attendees enjoying over 450 performances across theaters and off the street; The Bogotá Philharmonic is the most important[according to whom?] symphony orchestra in Colombia, with over 100 musicians and 140 performances a year. The city has been a member of the UNESCO Creative Cities Network in the category of music since March 2012. The Cristóbal Colón Theater, the country's oldest Opera House, opened in 1892. 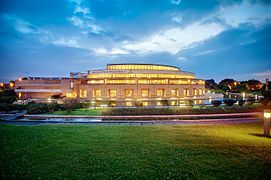 It is home to the National Symphony Association's major act, the National Symphony Orchestra of Colombia. Rock al Parque or Rock at the Park is an open air rock music festival. Recurring annually, it gathers over 320,000 music fans who can enjoy over 60 band performances for free during three days a year. The series have been so successful during its 15 years of operation that the city has replicated the initiative for other music genres, resulting in other recent festivals like Salsa at the Park, Hip Hop at the Park, Ballet at the Park, Opera at the Park, and Jazz at the Park. Kids' Choice Awards Colombia, are the most important[according to whom?] awards given in the city by Nickelodeon and the first ceremony was given in 2014 by the singer Maluma and in Corferias the ceremony has been the home of shows given by artists like Austin Mahone, Carlos Peña, Don Tetto and Riva among others. Bogotá has worked in recent years to position itself as leader in cultural offerings in South America, and it is increasingly being recognized worldwide as a hub in the region for the development of the arts. In 2007, Bogotá was awarded the title of Cultural Capital of Ibero-America by the UCCI (Union of Ibero-American Capital Cities), and it became the only city to have received the recognition twice, after being awarded for the first time in 1991. Bogotá gave the Spanish-speaking world José Asunción Silva (1865–1896), Modernism pioneer. His poetic work in the novel De sobremesa has a place in outstanding American literature. Rafael Pombo (1833–1912) was an American romanticism poet who left a collection of fables essential part of children imagination and Colombian tradition. BD Bacatá, under construction, will be the city's tallest building. The urban morphology and typology of colonial buildings in Bogotá have been maintained since the late nineteenth century, long after the independence of Colombia (1810). 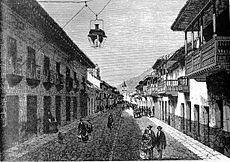 This persistence of the colonial setting is still visible, particularly in La Candelaria, the historical center of Bogotá. Also kept up are the colonial houses of two stories, with courtyards, gabled roofs, ceramic tiles and balconies. In some cases, these balconies were enclosed with glass windows during the Republican period, a distinguishing feature of the architecture of the sector (for example, the House of Rafael Pombo). In 2015 BD Bacatá was inaugurated, surpassing the Colpatria Tower to become the tallest building of the city and of Colombia. The building its expected to be the beginning of the city's downtown renovation. In 2007 Bogotá was named World Book Capital by UNESCO. Bogotá is the first Latin American city to receive this recognition, and the second one in the Americas after Montreal. It stood out in programs, the library network and the presence of organizations that, in a coordinated manner, are working to promote books and reading in the city. Several specific initiatives for the World Book Capital program have been undertaken with the commitment of groups, both public and private, engaged in the book sector. The National Library of Colombia (1777), a dependence of the Ministry of Culture and the Biblioteca Luis Angel Arango (1958), a dependence of the Bank of the Republic are the two largest public libraries in the city. The first is the repository of more than two million volumes, with an important collection of ancient books. The latter has almost two million volumes, and with 45,000 m2 (480,000 sq ft) in size, it hosts 10,000 visitors a day; the Library Alfonso Palacio Rudas is also a dependence of the Bank of the Republic, and is located at the north of the city, with about 50,000 volumes. Other large public libraries are the Library of Congress in Colombia (with 100,000 volumes), of the Instituto Caro y Cuervo (with nearly 200,000 volumes, the largest Latin American library in Philology and Linguistics), the Library of the Academy of History The Library of the Academy of Language, the Library of the Colombian Institute of Anthropology and History ICANH, and many university libraries. Bogotá is home to historical records housed in the General National Archive, a collection of about 60 million documents, one of the largest repositories of primary historical sources in Latin America. Bogotá is also home to the Musical Archive of the Cathedral of Bogotá (with thousands of books and choral song-colonial period), the Archdiocesan Archive, the Archive of the Conciliar Seminary of Bogotá, the Archive History National University of Colombia and the Archive of the Mint in Bogotá, under the Bank of the Republic. Besides the Ibero-American Theater Festival, the largest theater festival in the world, the city has forty-five theaters; the principal ones are the Colon Theater, the newly built Teatro Mayor Julio Mario Santo Domingo, the National Theater with its two venues, the traditional TPB Hall, the Theater of La Candelaria, the Camarin del Carmen (over 400 years old, formerly a convent), the Colsubsidio, and a symbol of the city, the renovated Teatro Jorge Eliecer Gaitan, León de Greiff Auditorium (home of the Bogotá Philharmonic Orchestra), and the Open Air Theater "La Media Torta", where musical events are also held. The Ibero-American Theater Festival, is not the only acclaimed festival. There are many other regional and local theater festivals that are celebrated and maintain the city active year-round . Amongst these is the "Alternative Theater Festival". Bogotá has its own film festival, the Bogotá Film Festival, and many theaters, showing both contemporary films and art cinema. Bogota's international art fair, ArtBo, takes place in October of every year and showcases thousands of works covering arts across all formats, movements, and concepts. Before the Spanish conquest, the beliefs of the inhabitants of Bogotá formed part of the Muisca religion. From the colonial period onwards, the city has been predominantly Roman Catholic. Proof of this religious tradition is the number of churches built in the historic city center. The city has been seat of the Roman Catholic Archdiocese of Bogotá since 22 March 1564. The seat of the Archbishop is the Primatial Cathedral of Bogotá; the archdiocese itself is located in new buildings in the north of the city. However a large group of the population nowadays declares itself non-practicing. 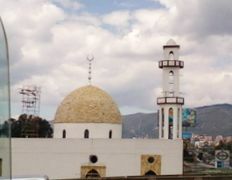 The city has a mosque located in the area of Chapinero called the Estambul mosque, a mosque being built on the Calle 80 with Cra 30 called Abou Bakr Alsiddiq mosque and which is the first in the city to have the traditional Islamic architecture, and an Islamic Center called Al-Qurtubi. An Eastern Orthodox church and the San Pablo Anglican Cathedral, the mother church of the Episcopal Church in Colombia, are both located in Chapinero. 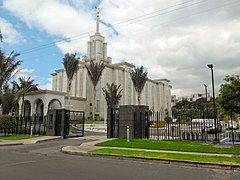 The Bogotá Colombia Temple of The Church of Jesus Christ of Latter-day Saints is located in the Niza neighborhood. There are four Buddhist centers located in the north of the city. 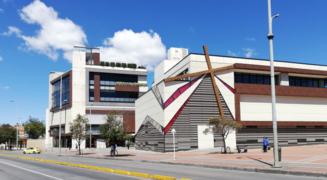 There is also a wide variety of Protestant churches in different parts of the city, including the Bogotá Baptist Chapel, the non-denominational Union Church, and the St. Matthaus Evangelical Lutheran Church which holds services in German as well as Spanish for the German-Colombian community. There is a broad array of restaurants in Bogotá that serve typical and international food. Parque de la 93, Usaquén, Zona T, The G Zone, La Macarena, La Candelaria, The parkway and the International Center are some of the main sectors where a number of international restaurants are found, ranging from Argentinian, Peruvian, Venezuelan, Brazilian, Mexican, American establishments to Arabic, Asian, French, Italian, Russian and British bistros, rotisseries, steakhouses and pubs, just to name a few. 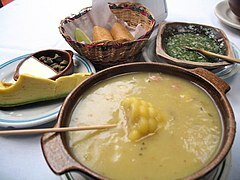 Typical dishes of Bogotá include the ajiaco, a soup prepared with chicken, a variety of potatoes, corn on the cob, and guascas (an herb), usually served with sour cream and capers, and accompanied by avocado and rice. Tamale is a very traditional Bogotá dish. Colombian tamal is a paste made with rice, beef, pork and/or chicken (depending on the region), chickpea, carrot, and spices, wrapped in plantain leaves and steam-cooked. Figs with arequipe, strawberries with cream, postre de natas and cuajada con melao are some of the main desserts offered in the city. 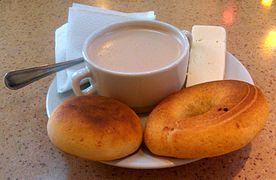 Canelazo is a hot drink from the Altiplano prepared with aguapanela, cinnamon and aguardiente. Another hot beverage is the carajillo, made with coffee (tinto as it is known in Colombia) and aguardiente. 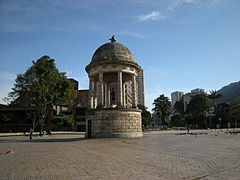 There are numerous parks in Bogotá, many with facilities for concerts, plays, movies, storytellers and other activities. Simón Bolívar Metropolitan Park is a large park regularly used to stage free concerts (such as the annual Rock al Parque festival). Parque de la 93 has day-time leisure activities and nightlife. Several of the top restaurants and bars in the city are in this park, the park is known around the world like the Colombian Pike Place by having the first Starbucks in all the country and Carl's Jr. as well. To the north of Bogotá, in the municipality of Tocancipá; Jaime Duque Park has rides, a giant map of Colombia, various exhibits, a zoo, and a big hand holding the world symbolizing God. There is a reproduction of the Taj Mahal in the park with a collection of reproductions of famous paintings. The park is also used for large concerts, mainly electronic music ones. Tourist train is a sightseeing train, popular with Bogotá residents, which runs to outlying towns Zipaquirá, Cajicá and Nemocón along the lines of the former Bogotá Savannah Railway on weekends. The route to Zipaquirá (known for its salt cathedral) is 53 kilometres (33 miles) long. Another line goes towards the north for 47 km (29 mi) and ends at Briceño. The Usaquén Park is another of the most important parks in the city several of the best restaurants in this city are located there, is recognized to have street performers such as storytellers, magicians, jugglers, etc. and also for being one of the most decorated parks in the city during Christmas time. Football has been declared a symbol of Bogotá, and is widely played in the city. There are three professional clubs in the city, Santa Fe, Millonarios, and La Equidad. The main stadium in the city is The Campín Stadium (Estadio Nemesio Camacho El Campín) home of the local teams Santa Fe and Millonarios, In 2001 The Campín Stadium has been the place for the 2001 Copa América final between the Colombia national football and the Mexico national football, final score 1–0 in favor of the home team and finally getting their first continental cup. The other soccer venue is the multi-use Techo Metropolitan Stadium which is the home of La Equidad. ^ "Consulta de la Norma:". Alcaldiabogota.gov.co. Retrieved 19 June 2017. ^ "Bandera, Escudo e Himno de Bogotá - Instituto Distrital de Turismo". bogotaturismo.gov.co. Archived from the original on 5 March 2017. Retrieved 19 June 2017. ^ "Estimaciones de Población 1985 – 2005 y Proyecciones de Población 2005 – 2020 Total Municipal por Área (estimate)". Departamento Administrativo Nacional de Estadística. Retrieved 10 February 2017. ^ Henderson, James D.; Delpar, Helen; Brungardt, Maurice Philip; Richard N. Weldon (2000). A reference guide to Latin American history. M.E. Sharpe. p. 61. ISBN 978-1-56324-744-6. Retrieved 5 August 2011. ^ a b Duncan Smith. "World City Populations 1950 - 2030". Retrieved 18 December 2015. ^ a b "Bright lights, big cities. Urbanisation and the rise of the megacity". economist.com. Retrieved 23 December 2015. ^ a b "Bogotá una ciudad Andina" (in Spanish). la Alcaldía Mayor de Bogotá. Retrieved 2010-11-19. ^ a b "2005 Census" (in Spanish). Departamento Administrativo Nacional de Estadística DANE. Retrieved 2012-02-10. ^ "Organización del Distrito Capital" (in Spanish). bogota.gov.co. Archived from the original on 4 March 2016. Retrieved 5 January 2016. ^ "Hot spots: Benchmarking global city competitiveness" (PDF). The Economist Intelligence Unit. Retrieved 5 January 2016. ^ a b Harvard University (2011). The Talent Issue. Harvard Business Review. ^ "IBM destaca a Bogotá como la ciudad con mayor número de proyectos de inversión extranjera en Latinoamérica" (in Spanish). IBM-Plant Location International (IBM-PLI). Retrieved 5 January 2016. ^ "El Dorado International Airport". eldorado.aero. Retrieved 9 September 2016. ^ "2014 Global Cities Index and Emerging Cities Outlook". atkearney.com. Retrieved 5 January 2016. ^ a b Rodríguez, J.F. (1982) . El Carnero [The Ramp] (in Spanish). Medellín, Colombia: Bedout. ^ "Moors in Latin America". Samual Calde.com. Archived from the original on 25 December 2010. Retrieved 1 October 2010. ^ "Climate: Bogotá – Climate graph, Temperature graph, Climate table". Climate-Data.org. Retrieved 8 October 2013. ^ a b "Weatherbase: Historical Weather for Bogota, Colombia". Weatherbase. Retrieved 18 October 2011. ^ a b c "Promedios 71-00" (in Spanish). IDEAM. Retrieved 18 October 2011. 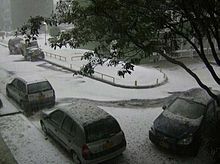 ^ "Bogotá, Colombia - Monthly weather forecast and Climate data". Weather Atlas. Retrieved 7 February 2019. ^ "Microsoft Word - PerfilMunicipal.doc" (PDF). Retrieved 2013-03-12. ^ "Departamento Administrativo Nacional de Estadística (DANE)". dane.gov.co. ^ "Microsoft Word - PerfilMunicipal.doc" (PDF). Retrieved 2014-06-03. ^ "Bogotá confirma baja histórica en tasa de homicidios" (in Spanish). El Tiempo. Retrieved 2 January 2018. ^ "Homicidios" (PDF) (in Spanish). El Tiempos. p. 36. Retrieved 29 December 2008. ^ "ENCUESTA DE PERCEPCIÓN Y VICTIMIZACIÓNBOGOTÁ Y LAS LOCALIDADES" (PDF) (in Spanish). Archived from the original (PDF) on 4 December 2011. ^ "Bogotá se consolida como centro para la inversión extranjera" (in Spanish). Alcaldía Mayor de Bogota. 2007. Retrieved 29 December 2008. ^ "GaWC – The World According to GaWC 2016". lboro.ac.uk. ^ "Latin America City Travel and Tourism Impact 2017" (PDF). wttc.org. Retrieved 30 November 2017. ^ a b "Bogota becomes full alliance partner of BestCities Global Alliance". traveldailynews.com. Retrieved 26 May 2016. ^ "Bogotá, Colombia Profile". bestcities.net. Retrieved 26 May 2016. ^ "World Summit of Nobel Peace Laureates". bogota-nobelpeacesummit.com. Retrieved 8 October 2017. ^ "One Young World 2017 Bogotá Agenda". oneyoungworld.com. Retrieved 8 October 2017. ^ "Chapinero waterfalls – Hiking a secret place in Bogotá – Review of Andes EcoTours, Bogota, Colombia – TripAdvisor". www.tripadvisor.com. Retrieved 2015-09-17. ^ "Alameda de Quebrada Vieja (Bogota, Colombia): Address, Hiking Trail Reviews – TripAdvisor". www.tripadvisor.com. Retrieved 2015-09-17. ^ "Colombia rising? | Links International Journal of Socialist Renewal". Links.org.au. ^ a b CONGRESO DE COLOMBIA. Ley 142 de 1994 (julio 11), artículo 102. ^ "Better Transport, Water and Sanitation for the Urban Poor in Bogotá". Worldbank.org. Retrieved 19 June 2017. ^ "Bogotá Transportation Terminal & Train Station" (in Spanish). Bogotá-dc.com. 2008. Retrieved 29 December 2008. ^ "Millonaria condena al Distrito por fallas en Transmilenio" (in Spanish). El Espectador. 2008. Retrieved 29 December 2008. ^ "Bogotanos olvidaron para qué fue creado el Día sin carro" (in Spanish). Cambio. 2 November 2008. Archived from the original on 20 August 2008. Retrieved 29 December 2008. ^ King, Danny (February 26, 2014). "Bogota citizens give up automobiles in first ever Car Free Week". green.autoblog.com. autobloggreen. Retrieved 28 August 2014. ^ "Bogota El Nuevo Dorado BOG Airport – Bogota, Colombia". ifly.com. ^ "Bogota to have second airport by 2021". Colombia Reports. Retrieved 1 February 2015. ^ "Colombia to move military airbase to expand El Dorado airport". Colombia Reports. 2013. Retrieved 9 January 2014. ^ Woods, Sarah (2012). Colombia. Bradt Travel Guides. p. 123. ISBN 9781841623641. ^ Porup, Jens; Raub, Kevin; Reid, Robert (6 June 2009). Colombia. Lonely Planet. pp. 63–. ISBN 978-1-74220-326-3. Retrieved 10 March 2013. ^ "Bogota Public Transportation Statistics". Global Public Transit Index by Moovit. Retrieved June 19, 2017. Material was copied from this source, which is available under a Creative Commons Attribution 4.0 International License. ^ "Colombia". Drclas.harvard.edu. Archived from the original on 3 July 2009. Retrieved 25 July 2009. ^ Banco de la Republica "2008 Press Release". Retrieved 3 September 2009. ^ Museo Nacional de Colombia "History" Archived 6 June 2013 at the Wayback Machine. Retrieved 3 September 2009. ^ "Bogota designated as UNESCO City of Music". www.unesco.org. United Nations Educational, Scientific and Cultural Organization. Retrieved 2018-10-03. ^ Rock at the Park "15th Edition of the Concert is over"
^ Noticias de Bogotá: Arte "ArtBo 2009 – Reportaje"
^ "BD Bacatá – Sitio Oficial". bdbacata.com. Archived from the original on 28 March 2015. Retrieved 31 March 2015. ^ Staff, The City Paper (2018-10-17). "The International Art Fair of Bogotá ready to host the world". The City Paper Bogotá. Retrieved 2019-02-10. ^ Portada. Mezquita Estambul Bogota. ^ Casa | Mezquita Bogota, Islam en bogota. Mezquitabogota.org. ^ Islam en Colombia, Bogota: Mezquita, Conferencias, Información Archived 5 April 2013 at the Wayback Machine. Piensaislam.com. ^ "Ajiaco Bogotano (Chicken and Potato Soup)". Washington Post. 1 March 2006. ^ "Copa Mundial de Futsal de la FIFA se jugará en Colombia en 2016". fcf.com.co. 28 May 2013. Archived from the original on 3 December 2013. ^ "Simbolos de Bogotá" (in Spanish). Alcaldía Mayor de Bogotá. 2007. Archived from the original on 7 July 2011. Retrieved 29 December 2008. ^ "New York City Global Partners". Web.archive.org. 14 August 2013. Archived from the original on 14 August 2013. Retrieved 15 October 2017. ^ Ash, Alexander (23 April 2012). "Top 10 of London: 250 lists about London that will simply amaze you!". Octopus. Retrieved 15 October 2017 – via Google Books. ^ "Chicago and Bogotá become sister cities". Colombia Reports. Archived from the original on September 10, 2017. Retrieved 2017-09-10. ^ "Sister Cities". Seoul Metropolitan Government. Archived from the original on July 5, 2017. Retrieved 2017-09-10. ^ "Sister Cities Program". City of Miami. Archived from the original on June 11, 2011. Retrieved 2017-09-10. ^ Syed Shayan (February 2015). "Ground Realities 4". Akhbar Peela. Archived from the original on 5 March 2016. Retrieved 23 October 2015. ^ Pessotto, Lorenzo. "International Affairs – Twinnings and Agreements". International Affairs Service in cooperation with Servizio Telematico Pubblico. City of Torino. Archived from the original on 2013-06-18. Retrieved 2013-08-06. Correal Urrego, Gonzalo. 1990. 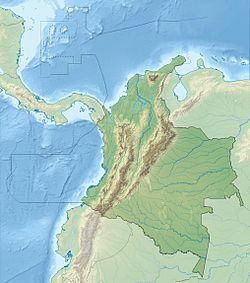 Evidencias culturales durante el Pleistocene y Holoceno de Colombia – Cultural evidences during the Pleistocene and Holocene of Colombia. Revista de Arqueología Americana 1. 69–89. Accessed 2016-07-08.
Cooper, Jago, and Carl Henrik Langebaek. 2013. The Lost Kingdoms of South America – Episode 3 – Lands of Gold. Accessed 2016-07-14. Gamboa Mendoza, Jorge. 2016. Los muiscas, grupos indígenas del Nuevo Reino de Granada. Una nueva propuesta sobre su organizacíon socio-política y su evolucíon en el siglo XVI – The Muisca, indigenous groups of the New Kingdom of Granada. A new proposal on their social-political organization and their evolution in the 16th century. 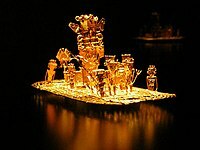 Museo del Oro. Accessed 2016-07-08. Broadbent, Sylvia M. 1968. A prehistoric field system in Chibcha territory, Colombia. Ñawpa Pacha: Journal of Andean Archaeology 6. 135–147. Izquierdo Peña, Manuel Arturo. 2014. Calendario Muisca – Muisca calendar. Accessed 2016-07-08. Daza, Blanca Ysabel. 2013. Historia del proceso de mestizaje alimentario entre Colombia y España – History of the integration process of foods between Colombia and Spain (PhD), 1–494. Universitat de Barcelona. Ocampo López, Javier. 2013. Mitos y leyendas indígenas de Colombia – Indigenous myths and legends of Colombia, 1–219. Plaza & Janes Editores Colombia S.A..
Groot, Ana María. 2014 (2008). Sal y poder en el altiplano de Bogotá, 1537–1640, 1–174. Universidad Nacional de Colombia. Francis, John Michael. 2002. Población, enfermedad y cambio demográfico, 1537–1636. Demografía histórica de Tunja: Una mirada crítica. Fronteras de la Historia 7. 13–76.